Significant changes are being made to the Quarantine and Digest services. The changes include many formatting improvements and new features. We will gradually be upgrading all accounts to receive these improvements over the next 4-6 weeks. The changes have been aimed at streamlining the most commonly used functions and we believe it will make your interactions with these services less cumbersome and more efficient. We hope you’ll agree! Let us know by dropping a note to support@securence.com. Allow – If you have access to your trusted senders (whitelist), you will now see an Allow action link next to each message in your digest. This will deliver the message to your inbox and add the sender to your list of trusted senders, to prevent future blocks. The message will also no longer appear in the quarantine (no need to delete it separately). Block – If you have access to your blocked senders (blacklist), you will now see a Block action link next to each message in your digest. This removes the message from your quarantine and drops future messages from that sender by adding their address to your personal blacklist. You will no longer see messages in your quarantine or digest if you have chosen to block them. Release – As before, this will deliver the message to your inbox. Now, by default, it also removes it from your quarantine view (no need to delete it separately). Report False Positive – This option has been removed since it is no longer necessary. Securence’s machine learning algorithms take all released and allowed messages into consideration when analyzing for inaccurate signatures. By releasing or allowing a message, you are indicating to Securence that it is not spam. As indicated above, messages matching user-level blacklists will no longer appear in the user’s digest or quarantine. However, they will still be visible in the domain-level quarantine for help desk support. To simplify and improve mobile viewing, two columns have been removed from the digest: To and Type. The list of affected To addresses is now included at the bottom of the digest. The date column has been replaced with a time column. Messages are still sorted by datetime with most recent first. Therefore, messages on the same date are grouped together with a date header. The digest has an improved appearance in MS Outlook and on mobile devices. The “From” column of the digests now displays the sender address found in the RFC5322.From header. Previously, the RFC5321.MailFrom (envelope sender) was displayed. 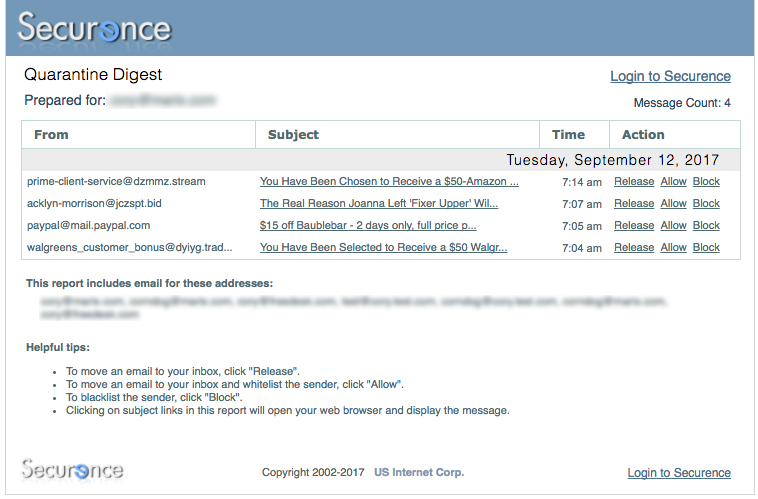 If you are eager to try out these new features on your domain, please let us know by e-mailing support@securence.com. Otherwise, look for these changes to be applied to your domain within the next month or so. School is a very different place from what it was just 10 or 15 years ago. From kindergarten and grade school, all the way through university, students, teachers and school administrators rely on web-based tools and email to get much of their work done. However, for all the benefits of web-based learning, there are always security risks. In the past few years, there have been a number of alarming data breaches at colleges and universities. For example, the recent phishing scam that uses Google Docs to breach digital security and harvest sensitive information is a huge issue for schools and post-secondary institutions right now. Even at the K-12 level, web security is a concern as students often store or share sensitive information—such as grades and teacher correspondence—online. When web use isn’t secure, not only can it result in serious risks; it also distracts administrators and teachers from their primary calling: teaching. Fortunately, valuing security doesn’t have to mean taking your school’s operations offline. Securence provides security solutions to protect your data and keep things running smoothly. Here are just a few features that have K-12 schools, colleges and universities turning to Securence email filtering – a system that even prevents the latest threat from Google Docs’ phishing scam. Securence’s robust virus and malware control keep external threats at bay. This is important because young students don’t always identify malicious emails or phishing schemes, putting them at risk of inadvertently compromising their email and the school’s computers. Having a tough and sophisticated filters make it difficult for security breaches to occur at a student level. Additionally, Securence’s 30-day shadow feature allows students to retain anything that goes through their inbox or outbox, helping them to avoid losing instructions, teacher correspondence and assignments. From a teaching and administrative perspective, email security is important, but so is operational ease. Securence’s administrator controls provide instant help desk access to resolve email issues, so teachers and administrators can return to their work quickly. The email re-delivery feature ensures no sent or received emails will be lost when issues arise. Additionally, email continuity allows email to keep functioning during an outage, ensuring that teachers and administrators won’t lose their ability to continue vital communications with school boards, parents or students. Record keeping is another aspect of school administration that has been moving online. Reliable record keeping is important, especially when a student’s academic history is at stake. Securence’s email archiving (www.securence.com/email-archiving-solution) feature allows you to store emails for an indefinite period of time, ensuring you never lose any important communications. Of course, as with student email, Securence provides advanced malware security for both in and outbound email, protecting mailboxes on the domain as well as recipients of email from the school. Securence is compatible with Office 365, Google apps and on-premise email systems, so administrators can operate any of those systems while enjoying the benefits of Securence. All schools want strong email security features, but some feel they have to go without because of budget restrictions. Fortunately, Securence offers some of the industry’s best educational pricing, making it a valuable choice. Are you ready to improve your school’s email security and efficiency? Contact Securence today to see what we have to offer. 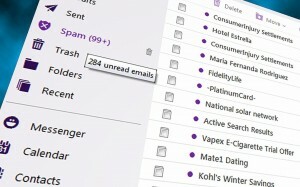 Almost from its very inception, email has been a double-edged sword. An essential aspect of contemporary business, it is also a potential threat to the valuable data we hold on our computers. And while regular spam and email filters can stave off some of the potential threats that come through our inboxes, professionals need expert filtering systems too. At Securence, the latest email filtering services can help your company avoid many of the pitfalls that comes from poorly-filtered email. Here are just a few ways that our email filtering solution can save your company future headaches, and potential disasters. 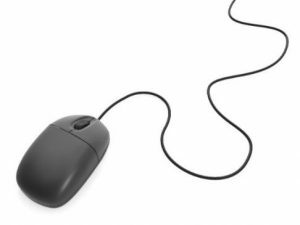 Email spam is a game of cat and mouse, one that is constantly changing and adapting to new ways of doing things. You can see this ongoing battle play out in your own email inbox if you look for it. Every time you see a spam email come through, it means something has changed, a new tactic has been developed, and every time you see less spam, it means the filters have adapted. While many different email filter programs that come standard with email services try to be current in spam tactics and procedures, they simply do not have the resources or incentive to do a comprehensive job. But with the right email filter service, you can stay ahead of the spam and keep it out of your company’s inboxes. Spam and malicious emails come in many different forms, which is why up-to-date filters are absolutely essential, but strategies need to be increasingly twofold in their defenses. The first is filtration based on spam, the second is filtration based on maliciousness. Spam is often scam or mass email based, usually trying to convince people to give money to certain things, whether they are legitimate businesses or scams. But malicious emails are trying to download malicious code onto your emails. That requires them to be opened, and many email filters cannot see the underlying codes these emails have. The people who send these types of emails have also refined the art of being convincing in their subject lines, meaning people are more likely to open them. But with the right email filters, your email system can defend against these malicious emails as well, so you don’t have to deal with the viruses, worms, and other computer problems that come with poorly-filtered email accounts. When it comes to emails containing malicious code, the problem isn’t always immediate, it can often be long-reaching in its effects. Today’s viruses aren’t often trying to shut down computer systems, they’re trying to steal information that can be sold or used in a dangerous way. And when it comes to business computers, having that data siphoned off or compromised can lead to lawsuits, lost clients, and a tarnished reputation. That’s why email filtering services are absolutely necessary. Not just to protect your computers, but protect your business as well. Email Filtering Service—How Essential Are They for Small Businesses and Large Corporates? For many enterprises, whether they’re a small family business or an international corporation, email is an essential service. It not only saves time, it helps you connect with the people that are important to the business, including customers or clients, partners, and staff members. But for all its instantaneous messaging, email can also be curiously slow, namely because most emails are terrible at filtering out unwanted messages. If your company relies on emails to run every day, then you may need an email filtering service. Here are just a few reasons why it can help your business stay focused and improve efficiency. Spam is annoying, almost everyone can agree on that, but one of the most annoying aspects of spam isn’t the mail itself, it’s the messages that get lost in the shuffle as a result of spam. How often have people deleted important messages because they were getting rid of spam in their inbox? The simple reality of spam is that it causes disruptions and, as a result, inefficiencies. But with an email filtering service, you can help sort spam out of your employees’ inboxes before it even gets there. That means fewer missed emails, less pointless ones, and a better overall email experience. Constant emailing breaks people’s concentration and this phenomenon is only getting worse now that our emails come to us in a million different ways. Offers, specials, notifications for social media and more, all come to us at every minute of every day. Some of these are important, but many are tied to non-work related things. To lessen these distractions and allow your employees to stay focused on their actual work, you can subscribe to an email filtering service. A professional service can help your email systems differentiate between important work emails and spam from undesirable sources. It will help your staff stay on track and prevent them from filling their inbox space with unwanted mail. Emails are still one of the easiest ways to send viruses, and other malware to different computers. It’s surprisingly simple and many of the malicious software programs can download onto computers, and into your servers, without even being detected. But with the right email filtering service, you can help block out emails that contain a code that could ruin your business. It will scan emails for problems before sending them to your inbox. If a problem is discovered, the email never even turns up in the inbox, lessening your chance of inadvertently downloading dangerous malware. If your company wants to avoid the inefficiencies that can come as a result of having poor email filters, be sure to contact Securence about our email filtering service. It can help your company stay on track, make sure that important communications don’t get lost in the shuffle, and ensure that people’s emails aren’t causing undo stress. Only a professional email filtering service can help your company create custom filters that work for you and your staff.